The Arlington Million attracted Gio Ponti and Cape Blanco but another race half its value drew a deeper field. The grassy, 1-1/2 mile gr. 1 Sword Dancer at Saratoga was won by the favorite Winchester, although handicappers made a case on behalf of at least five of the seven runners. Emma Wilson dropped down from Woodbine to pilot Rahy’s Attorney. She almost stole the Sword Dancer aboard the seven-year-old gelding. Nevertheless, Cornelio Velasquez, riding with considerable confidence, swept his mount from last to first using much of the homestretch’s width in the process. Only Ramon Dominguez and Julien Leparoux defected from the Spa’s jockey community to ride in the Windy City. Two-year-old racing was in much evidence. The second race, named in honor of the late Steve Schwartz, a NYRA publicist, was won by The Prize Fighter. The Prize Fighter is owned by Flying Zee Stables, which was owned by the late Carl Lizza, a prominent New York horseman after whom the first race was named. The two-year-old colt How Do I Win was expected to win the sixth race. Instead, he faded badly for the second time in two career starts, both occasions on which he was odds-on. Eben Alsafa, a son of Pulpit for which Shadwell paid $525,000, was left at the gate in the seventh. Many bettors expected their money back. There was an inquiry but nothing other than the results as they happened came out of it. R.J. DuBois of Amsterdam, NY made the most of his visit to the racecourse. He asked Lauren Bisio to marry him. Bisio said “yes,” pleasing a couple dozen friends who applauded his proposal on the apron in front of Section K. “I asked the track if they’d put a notice or a picture on the tote board, but they wouldn’t,” the groom-to-be said, disappointed in at least one aspect of his grand adventure. 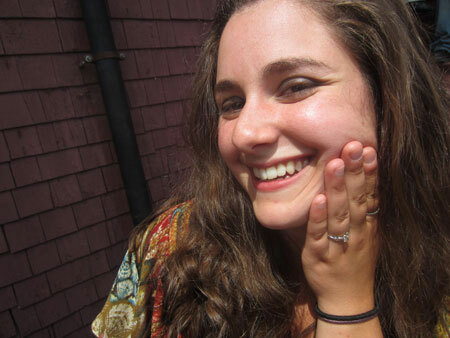 Lauren Bisio flashes her diamond engagement ring. On Sunday morning, at its Round Table Conference on Matters Pertaining to Racing, the Jockey Club will release a commissioned report that is expected to recommend strategies that the sport should pursue in order to stop its precipitous declines in recent years. Some politicians in New York are itching to revoke NYRA’s 25-year lease so they can allow widespread gaming development without benefit to racetracks. Wonder what the report will say about the marriage of horse racing and casinos. Free tee-shirts will be distributed on Sunday afternoon to all people who pay the $3 admission fee. On Sunday evening, the Fasig-Tipton Company will conclude its two-night NY Bred Preferred Yearling Sale, an event that coincides with the 42nd anniversary of Woodstock. The Philadelphia Orchestra’s run at SPAC ended. 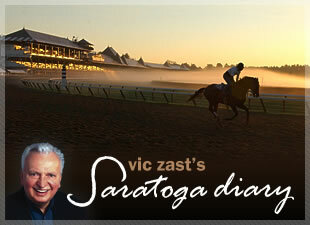 Vic Zast is the author of “The History and Art of 25 Travers.” He invites you to visit with him on Facebook and Twitter.